The Best wheelchair Designers? Wheelchair Riders! Everest and Jennings is the brand name of the world's largest wheelchair manufacturer. Many people do not realize that the original designer and founder of this global wheelchair business was disabled and rode a wheelchair himself. The original "E&J" wheelchair - which was a breakthrough in its day - grew out of a disabled person's creative response to an unmet personal need. But as E&J Industries grew, the company became more interested in mass-production than in innovation. Fortunately, however, other disabled persons have continued to advance the state of the art. Like Herbert Everest, many of the most innovative wheelchair designers in the past 20 years have themselves been wheelchair riders. One of the world's most caring and creative wheelchair designers and builders is Ralf Hotchkiss, who lives in California, USA. Ralf became paraplegic (paralyzed from his chest down) from a motorcycle crash when he was a teenager. Since then, Ralf trained as a mechanical engineer, and has designed and built a wide range of innovative wheelchairs and other equipment. When Ralf first decided to build a 4-wheel drive wheelchair, he had a hard time figuring a way to transfer power from the large back wheels to the small front wheels. The obvious solution was to use bicycle chains. 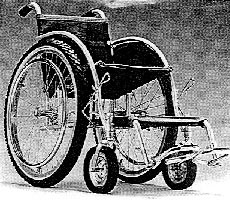 But for this, the front wheels would need to not swivel (pivot) to make turns, as do caster wheels of most wheelchairs. Furthermore, caster wheels need to be fairly small to avoid bumping the footrests when they pivot. But, to move easily on rough ground, Ralf's front wheels needed to be relatively large. What to do??? The solution, Ralf explains, came from the Bible: the so-called Ezekiel Wheel, a circle of small wheels that together form a larger wheel. With this idea, Ralf created a front wheel made of a series of small rubber cones, positioned in a circle around the central hub. Each cone is mounted on its own ball bearings, so it can roll sideways, while the wheel as a whole rolls forward. This combination of several small wheels within a bigger one gives a multi-directional roll similar to that of a caster wheel. However, the forward direction of the main wheel is fixed and it does not pivot. This is what Ralf needed for his 4-wheel drive. 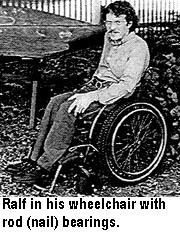 Although Ralf's 4-wheel drive wheelchair worked well, it never became popular. Building it was too costly and time consuming. Just the front wheels used 24 bearings and 20 individually vulcanized cones. Ralf's interest turned to developing low-cost wheelchairs for the Third World, using "appropriate technology." His incentive was sparked on a visit to Nicaragua in 1980, shortly after the Sandinistas overthrew the Somoza dictatorship. 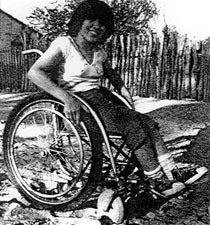 A group of young Sandinistas who had been spinal-cord injured during the war had formed a grassroots group called Organization of Disabled Revolutionaries (ORD). They had so much trouble getting wheelchairs that four of their members were sharing a single wheelchair. Most wheelchairs in Nicaragua were imported from the USA. With the stiffening US embargo, both chairs and spare parts were very hard to find. The ORD members had difficulty reintegrating into society and finding work because they lacked mobility. Some, whose wheelchairs had broken down, had gone back to dragging themselves about in their homes, unable to leave. 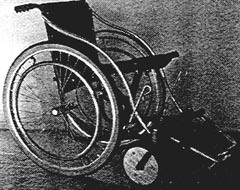 For these reasons, the Disabled Revolutionaries set up a small wheelchair repair shop. But they ran into problems. Commercial imported chairs, such as E&Js, have poor-quality bearings which wear out quickly in a rough, dusty environment. Because they are not a standard size, they could only be replaced with over-priced bearings purchased from the original manufacturer. The cost was prohibitive. In places like Nicaragua, where bearings of any kind are often not available, wheelchair maintenance becomes extremely difficult. Clearly, such dependence on expensive, hard-to-maintain, imported chairs increased people's handicaps. Ralf worked with ORD to design a low-cost wheelchair that could be built from local materials by modestly-skilled disabled workers. The result was the Torbellino, or Whirlwind Wheelchair. Within a year, ORD was operating a mini-factory in which a team of disabled persons built this home-grown design. THE WHIRLWIND WHEELCHAIR is relatively easy to build in a modestly-equipped shop. Yet its quality is excellent. As a wheelchair rider himself, Ralf appreciates the need for a light-weight, compact, easy-rolling, trouble-free chair. The design of the Whirlwind is simple and stream-lined, but a great deal of skillful engineering has gone into it. The frame of the chair is made from electric-conduit steel tubing, available in building supply stores around the world. The back wheels are bicycle wheels. The bearings (of the early model) are standard high-speed bearings used in small electric machinery. Used bearings can often be obtained at very low cost in electrical repair shops. These are finely made bearings for high speed use. Even secondhand ones, used in a wheelchair, will long outlast commercial wheelchair bearings. The beauty of the Whirlwind is that it is made in small community shops by disabled people who recognize the need for a chair that is adapted to the needs of the individual rider. These wheelchairs tend to be custom-built or adapted. In the process, new design opportunities arise, and the chairs come closer to matching the varied needs of their users. Since helping ORD in Nicaragua, Ralf has traveled around the world, facilitating workshops and helping groups of disabled persons begin to produce appropriate wheelchairs. One of the first groups he worked with was PROJIMO, in the mountains of Western Mexico. Over the years, Ralf has led workshops and worked with disabled wheelchair builders in 30 countries in Latin America, Africa, Asia, and Russia. Ralf calculates that, of the 20 million people in the Third World today who need wheelchairs, fewer than one percent have them. He dreams of the day when all who need a wheelchair will have a chair fully suited to their needs. To this end, he and his friend, Peter Pfaelzer at San Francisco State University, formed Wheeled Mobility, a small non-profit organization which is rapidly turning into an international network of wheelchair builders and designers. If there are ever to be enough wheelchairs - chairs that are truly liberating to their riders - production must be decentralized and the building process must be demystified, with users leading the process. The basic design of the Whirlwind keeps evolving. Not only has Ralf continued to design and test new features himself, but he has gathered new ideas from groups of disabled persons around the world who are building local variations of the Whirlwind. It should be noted that many of these new features were developed in collaboration with disabled persons who expressed difficulties with the existing design or who wanted some particular modification. In this book, we do not give detailed instructions for making the Whirlwind wheelchair. A brief description can be found in the book, Disabled Village Children. Very detailed instructions - including suggestions for setting up and stocking a shop - are in Ralf's fine handbook, Independence Through Mobility (see page 343). For years, Ralf has been revising and updating this book, but new ideas come so fast that it is a never-ending process. In this chapter we will give a preview of just a few of the most innovative modifications and improvements of the Whirlwind chair. While developed primarily for the Whirlwind, most of these innovations can be adapted to other models, or even to commercial wheelchairs. 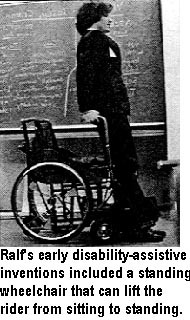 The basic front-caster design and the wheel forks remain much the same as in Ralf's original book (and in Disabled Village Children). A new design for bearings is discussed under entry #2. Here, we look at innovations in wheels and tires. Most modern commercial wheelchairs now come with tiny, hard, rubber or plastic front wheels. These are good for gliding over hospital floors or smooth, paved streets. But they function poorly on the rough, sandy paths of villages, or on the pitted, irregular roads of many Third World cities. For difficult or sandy terrain, front wheels need to be relatively big (6 to 9 inches in diameter) and wide (1+1/2 inches or more). Pneumatic tires (filled with air, under pressure) are light-weight, and on rough terrain they give a much smoother ride (which may add to the life of the wheelchair - and the rider). But air-filled tires also have short-comings. On rocky or thorny paths they puncture easily and often need to be patched and pumped up. Also, pneumatic tires that fit small caster wheels tend to be outrageously expensive. And, in many countries, they are simply not available. In the original version of Independence Through Mobility, Ralf gave an address in China where pneumatic tires and tubes can be bought in large quantities at relatively low cost. But this is hardly an ideal solution for equipment designed to use local, easily obtained materials. The wheels have presented another problem. 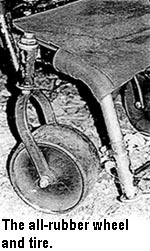 In the early Whirlwind design, Ralf recommended making front wheels from two discs of hard wood, glued together, with their grain crossing (at right angles) to prevent splitting. 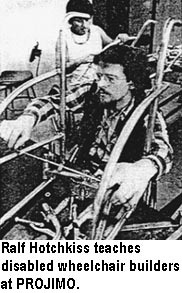 The photos of the Whirlwind, below and on p.195, show the wooden wheels. These wooden wheels were tried at PROJIMO in Mexico, but many users found them unsatisfactory. In spite of attempts to waterproof them with heavy varnish or epoxy finish, in the mud and rain they soon rotted and cracked. Riders in other countries reported similar problems. 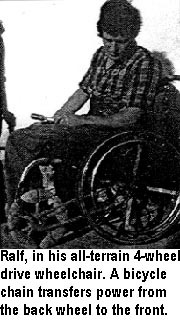 Another problem was that some people who wanted to purchase a wheelchair thought wooden wheels were primitive and ugly. They insisted on having "modern" wheels, even if more costly. Whatever the reasons, such preferences must be taken into account. Molded aluminum wheels were another alternative considered by Ralf. Workshops in Brazil and Bangladesh cast and lathe-turn their own aluminum wheels. But for most small production centers, this is impractical. The set-up costs are prohibitive. A rubber T tire, clamped between metal plates. A new design came from RESCU, a production center in Zimbabwe where disabled workers build assistive equipment, including the Whirlwind wheelchair. The front wheels consist of two round sheet-metal plates which grip a molded rubber tire. The tire, in cross section, is T-shaped. The center-arm of the T projects inward, and is firmly held with bolts between the 2 metal plates. The tire is vulcanized (heat-molded) in a specially lathe-turned steel mold. Once the mold is made, any shop that retreads car tires can produce these T-tires in small or large quantities at a relatively low cost. The wheel is made by cutting two round disks of sheet metal. The disks must be widely separated at the center to hold the hub firmly, and shaped so they can grip the T-tire. A dye of lathe-turned steel is needed to hammer, press or spin the disks into shape. The advantage of this Zimbabwe wheel is that, after a (fairly costly) initial investment for the molds and dyes, the production cost can be quite low. The tire, made of the same rubber as a car tire, is nearly indestructible. Its broad, T-shaped base has almost the same flexibility and springiness as a pneumatic tire. But it never punctures. Wider tires can be made for sand, to prevent sinking in. 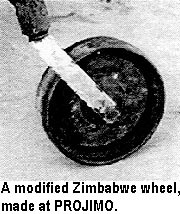 Problem: In Zimbabwe, the wheel was made of fairly thick sheet metal, pressed into shape in a large metal-press delivering tons of weight. In redesigning the wheel for smaller shops without such massive presses, Ralf began to experiment with a thinner grade of sheet-metal that could be hammered into shape when the metal disk was clamped over a dye. The PROJIMO wheel-chair builders tried making these wheels. At first, they appeared to work well. But, after repeated bumps into rocks and curbs, the metal disks bent and finally collapsed. The PROJIMO team tried using thicker sheet-metal, but it was too difficult to hammer into shape. Groups experimenting in other countries ran into similar problems. Solution: An all-rubber wheel and tire. After exploring many possibilities, Ralf found a simple solution. Do away with the sheet-metal disks and mold the entire tire and wheel out of vulcanized rubber, as a single unit. The central part of the wheel is cast thick enough to make it inflexible. The wide outer-edge that rolls against the ground is thin enough to provide a spongy flexibility. The wide center-part of the wheel is molded to grip the hub. A flange, welded to the hub, is bolted to the wheel. A big advantage to this all-rubber wheel is that it bends easily, to ride smoothly over irregular terrain. These simplified wheels show great promise. Eventually, they may be used for both front and rear wheels ofall-terrain wheelchairs. Among the biggest problems with many wheelchairs are the bearings. Commercial chairs use off-size ball bearings of relatively poor quality. They soon wear out, making the wheels wobbly and hard to push. Since the bearings are not a common size, often they cannot be replaced locally, but must be obtained at high cost from the wheelchair supplier or the manufacturer. Where chairs are imported, this may be very difficult or impossible. The Third World is littered with carcasses of fancy imported chairs whose bearings wore out. Problem: When PROJIMO began making wheelchairs, it could get all the second-hand bearings it needed free or at low cost from friendly repair shop owners in the closest cities. But as the program produced more and more chairs, the repair shops ran out of second-hand bearings. PROJIMO had to buy new bearings, which were very expensive. The 12 sets of bearings needed for a wheelchair cost as much as all the remaining materials! This pushed up the price so much that many poor families could not afford it. Many other wheelchair-making shops have had a similar experience. Solution: An idea to solve this problem came from India. On a visit there, Ralf Hotchkiss inspected the huge wheels of the traditional ox carts. They used an ancient form of rod bearing, or "needle bearings." The wheels rolled on a series of metal rods which fit snugly between the iron hub and the axle. Ralf experimented with hubs that, instead of ball bearings, use metal rods that roll between the axle and the hub tube. But the rods sometimes jammed in the hub. An old mountain farmer in the eastern USA solved this problem by showing Ralf that thinner rods in a longer hub do not jam. Ralf now uses carpenter's nails with their heads cut off. The nails form a circle of rollers between the axle bolt and metal hub tube. These new (though ancient) bearings show great promise. Hopefully they will contribute toward providing high-quality, long-lasting wheelchairs to many of the millions of people who need them, at a cost more within their reach. Different adjustments on wheelchairs. People who ride wheelchairs come in all shapes and sizes. So should wheelchairs. Many commercial chairs - although the basic models are standardized - come with adjustable footrests, armrests, and alternative positions for the rear hubs. Hub position. By changing the up-and-down position of the hubs in relation to the chair, the height and tilt of the seat can be changed. By changing the front-to-back position of the hubs, the balance of the chair can be changed. For example, a person without legs may need the rear hubs mounted farther back to avoid falling over backwards when going up-hill. An advantage to producing wheelchairs in small, community-based shops is that often they can be custom-made. Rather than adding a lot of mechanisms for adjustments to meet different user's needs (which add to both weight and cost), each chair can be personalized from the start, to meet the specific needs of the intended user. If the wheelchair makers are also wheelchair riders, they are likely to be more aware of and responsive to those needs, and to include the user in the planning and design process. Nevertheless, even in a small community shop, some amount of standardization can make production quicker, easier, and cheaper. It helps to have a selection of ready-made chairs available when they are needed. That way the person can try different chairs and pick the one that comes closest to meeting her or his needs. Last minute adjustments (or even more substantial changes) can then be made according to the individual's requirements. Goodness of fit - in terms of size, width, seat angle, angle and height of back, need for armrests, position of footrests, etc. - is essential. Decisions need to be made with the user, not for her, allowing enough time to test different alternatives and make well-informed decisions. ADJUSTABLE FEATURES OF THE WHIRLWIND. Although the Whirlwind has a basic (if evolving) design, it can be built and modified in different ways for different users. The height of the footrests can be easily adjusted by the user. Also, in response to his own need and that of others with spastic ankles, a PROJIMO wheelchair builder, Martín Pérez (see Chapters 37 and 39), has designed a simple way to adjust the sideways angle of the footrests. One of the greatest needs for adjustability in wheelchairs is the width of the seat, and thereby the width of the whole chair. Correct width is important for the stability and comfort of the rider, and for her ease in pushing the chair. A new design for easy adjustment of chair width has been developed, together with a new mechanism for folding the chair. Folding is important. For many wheelchair riders, it is essential that their chair can fold, to fit into a narrow space. This is especially important for those who need to travel in a bus, carry their chair in the back of a car, or pack it on a donkey. Problem: The original Whirlwind design included an upright X-brace that folded like scissors, as do most commercial chairs. But to fold well, the measurements, welds, and alignment must be exact. In PROJIMO, as in many small shops run by disabled persons, many workers are still learning their skills. There are few highly skilled crafts-persons. 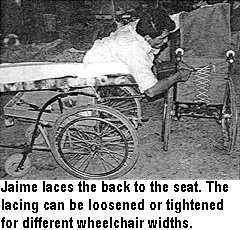 The resulting wheelchairs were often very difficult to fold. Users expressed their frustration. Solution:a horizontal folding device. To solve this common problem, Ralf and friends experimented with alternative folding devices until they came up with one that was more fool-proof. The new design folds horizontally, rather than vertically. Although it has more pieces and uses more welds than the X-brace, it requires less skill and precision to build, and gives consistently good results. PROJIMO now uses this new folding device in all its Whirlwind chairs, and has had fewer complaints. Adjustable chair and seat width. The horizontal folding mechanism also lends itself to adjusting the seat width to match the hip-width of the user. Small holes can be drilled in the cross bars of the adjustment device, so that the chair width can be adjusted, depending on which set of holes the center bolt is passed through. Upholstery. 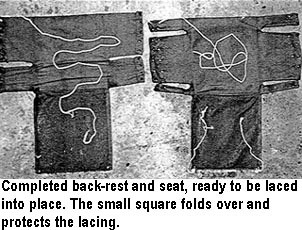 To avoid having to make new upholstery with different measurements for different seat adjustments, Ralf has devised wrap-around seat and back-rest cloths that can be laced up at different widths. The patterns for the back-rest and seat are similar. They consists of one square just a little bigger than the desired size of the back-rest or seat, and another square, 4 times as big. Hem the edges of both squares to prevent fraying. Then, fold the big square in half, and cut grooves as shown here. Sew together at all edges, except where the small square will be attached. Turn the resulting sack inside out, and sew on the small square. Make holes for lacing as shown. How appropriate is the new folding mechanism and adjustable seat? The answer depends on who you ask. Wheelchair riders and users (including Ralf) have mixed feelings. One of the beauties of the early Whirlwind design (with the vertical X-frame) is its simplicity, streamlined look, relatively few parts, and few welded joints (all of which contributed to the chair's low weight and low cost). The PROJIMO wheelchair builders are delighted because - although the new folding mechanism takes more welds and looks more complex - for them, it is easier to build successfully. That is important. Designs must be appropriate for builders as well as users. The search for better designs continues. Ralf's team is now experimenting with a folding mechanism developed by blacksmiths in Nyabondo, Kenya. This uses a vertical X-brace that is easier to build than is Ralf's original design. And improvements are always possible when builders and users work together creatively.